Join designers Brad Andres and Erik Dahlman and L5R Story Team Lead Katrina Ostrander to talk about FFG's new Legend of the Five Rings Living Card Game! So yeah the general feeling I'm getting from this AMA is that Shadowlands and Mantis aren't a thing in the radar, despite some flavour descriptions about it. We sure as hell aren't a faction, just a plot thingie looming in the background. This reboot put us before the time of Daigotsu so I won't even talk about the Spider Clan anymore, RIP my favorite clan you will be missed. Fingers crossed they remember that the Shadowlands has a vocal and active fanbase on the first expansion. To be fair, any questions about upcoming factions is basically asking them to commit to unreleased expansion content before the base set is even out, so that might be a question they aren't keen on answering. Still, they were dodging those Shadowlands questions like pros. I'd agree if nothing else that Daigotsu at least probably doesn't exist anymore. why do you say these hurtful things? It take it more them being silent on future planned plot developments. The first deluxe expansion will be roughly 6 months after the Core releases which would be roughly a year from now. Its also the perfect time for the first major twist in the story along with the introduction of a new major faction. They have said that both servants of the Dark Kami exist (even if they are hard to find) and that the minor clans will be part of the story. The only things they have not confirmed nor denied were Spider and Mantis. Yeah, they actually cant say if there is going to be a Shadowlands faction or cards yet. 1. That would be confirming releases not yet announced, so they wont confirm that. 2. You have to remember, this is also designed for new players in a new story timeline. The Shadowlands haven't been revealed yet in the major story and are just being hinted at. we are just going to have to wait. I'm not expecting Shadowlands for at least a year or two after release. 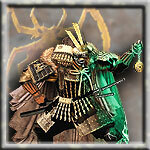 They want to introduce the main clans and get the players comfortable with their rokugan. When shadowlands comes back it will be a major story reveal in a deluxe expansion. Be patient my friends, we will rise in due time. Until then we infiltrate and enjoy. "There is only ONE emperor worthy of the right to rule, I will never cease till he takes his rightful place"
Played Ide Doburu at the 2014 Winter Court. Unfortunately, can't comment on the second question at this time! So don't expect anything right now. Well his father is a prominent figure in this first reveal. So this alternate reality Daigotsu may exist. However the Spider Clan was something that came out as the plot developted. If we follow a similar time table for when the Spider became a thing it will be a long time before we star t seeing our boys clad in Oni inspired armor. I have a hunch that we will see the Shadowlands and maybe even Daigotsu, but I doubt they will ever try to reach the controversial Spider. The amount of hate and disdain this faction had over so called veterans is probably a red flag. I'm kinda sad. Even if the Shadowlands do become a proper faction on the card game (in which I will fully support, of course) it is doubtful we will see them as a RPG faction, just as elements here and there and certainly not as a fully fledged player faction. Rokugan's back, but I need to adapt and change if I wish to support it via the rpg route. IF there is a RPG route, that is, we don't even know if we are getting a new rpg or a new Winter Court. Don't even try to use the old time table to guess when things will happen. No plot line from the previous version of L5R is sacrosanct. 2 Clan Champions have been genderswapped and one of them was a key part of a popular storyline. A storyline that is very much unlikely to happen no matter how fans of it try and justify it. We have even been rolled back to before the start of the previous storyline. We can not even guarantee that the Scorpion Clan Coup happens. I'd argue that this mentality might be very very wrong. Both Daigotsu and the Spider can be introduced far earlier than they were in the previous timeline. Daigotsu and the Spider could easily replace Yogo Junzo's army. But wouldn't that dissapoint some people? Yogo Junzo was a popular character back in the day right? Not really. The most popular thing about him back in the day was his artwork. His cards were terrible and he was basically a cackling madman with no personality who was killed off-camera by being run over by a horse. He was a plot device, not a character. Replacing the Yogo Junzo's Army faction with the Spider Clan doesn't mean Yogo Junzo would necessarily disappear as a character. The mad cackling undead shugenja could stay but becomes part of the Spider elite serving Hantei Daigotsu, the corrupt younger son of the current Emperor. Hoturi was popular, probably the most popular Thunder after Yoritomo by players. Now is a new character in a completely new situation. Nothing is sacred except Fu-Leng. Remember this. Yoritomo is no Thunder, and to equate him with their greatness is heresy. But he wasn't a Thunder. If you want to know for sure, you can always ask Thunder's buddy. You win the internet good sir! I've got a shiny penny that says they go with the Spider just to use those art assets they purchased. Phoenix Loyalist. Yobanjin Obsessionado. Played Tonbo Taira at WC III, Isawa Taisho at WC IV, and Daigotsu Yukari at WC V.
You are correct. Yoritomo wasn't a Thunder. the thunder from down under? Half of the art of the old game has Spider mons. One of the few things I'm willing to bet on are that when they bring back a shadowland faction with evil samurai, be they present in clan war or after, mechanically they will feel like the Hordes and the Lost, visually they will as well, but they will have the Spider Clan name and mon. Its IP they currently own and, as a friend in game design once mentioned, its unique from "The Horde" which is recognized by different groups as different things. "The Horde" is used in other IPs and games while "The Spider Clan" is not only trademarkable, but memorable. Even during polls set during the most HATED time for the Spider they were STILL in the top 3 most popular clans with Crane and Crab. They will sell product and I'm sure the numbers FFG got from AEG support that. It will probably take a few years, so get comfortable, but they will return in some way or another. Until then we do what we have all been trained to do, make fun of crab players, corrupt the weak, and constantly bring up Maho around Gunichi. from your lips to Daigotsu's ears, friends. I seem to recall a summary of the AMA being posted - does anyone have a link, please? You don't expect anything, then...BOOM! NINJAS!